We are excited to declare Smush Image Compression Torque’s 2017 Plugin Madness Champion! In the final championship round, Smush Image Compression defeated WordPress security plugin WordFence, making it Torque’s 2017 Plugin Madness Champion. Smush Image Compression’s journey to victory was not without challenges. Last year, the plugin made it to the exceptional 8 but was ultimately knocked out by powerhouse plugin WooCommerce. This year it faced off in some suspenseful matchups throughout the competition but held its own along the way. The plugin knocked out EWWW Image Optimizer in a nail-biting round 1 before going on to beat Autoptimize — optimization plugin — in round 2. Smush then went on to defeat Imagify Image Optimizer and Redirection in rounds 3 and 4, before making it to the semifinals where it took on Event Tickets. Smush Image Compression rallied its supporters, defeating Event Tickets with a staggering 91 percent of votes and then went head-to-head with WordFence in the championship round. 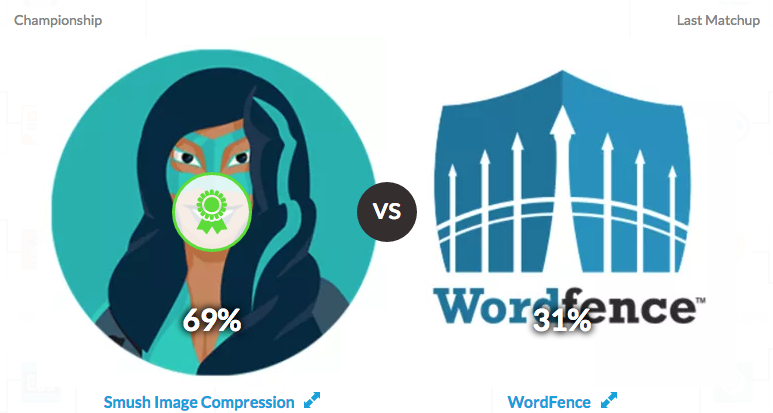 Smush Image Compression knocked out WordFence by a landslide, claiming 69 percent of the votes. Please join us in congratulating Smush Image Compression, Torque’s 2017 Plugin Madness Champion! Want to relive the action? Head over to PluginMadness.com to view the matchups and check out Smush’s journey to victory.